Provide teachers of mathematics with access to these classroom-ready resources, and professional learning supports, and ask how they are being used / adapted. 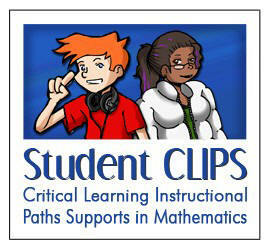 CLIPS (Critical Learning Instructional Paths Supports) are web-based interactive supports for students. They provide precise, personalized learning activities for instruction, remediation or enrichment. A complete list of CLIPS topics is shown under "Critical Learning Instructional Paths Supports". Use of Critical Learning Instructional Paths Supports (CLIPS) can increase student learning and influence teacher practice. These links provide activities that can be used by teachers or students to learn how to use Geometer’s Sketchpad. Will Richardson's keynote presentation at the 2008 'Making GAINS' symposium. Included on the web page are: a notebook file with information on how to make TIPS IWB lessons, as well as many samples of pre-made math lessons being used for instruction for grades 7 - 10. Tip sheets and video clips for using manipulatives in mathematics classrooms. Use to introduce manipulatives at all levels and provide suggestions and examples in practice. These are examples of classroom-ready materials using technologies such as Geometers' Sketchpad. This table provides access to supports for Ministry-licensed software.